Sometimes when troubleshooting Internet connection problems, we seem to try everything: from the most basic (is the cable still connected?) to the most advanced techniques (has someone hacked my router?). However, on occasions, nothing seems to fix the problem until we check some obscure settings that no one would suspect to be causing the frustration. Sometimes when you connect to a particular network, it may automatically configure proxy server settings on the device and therefore, when you re-connect a laptop, for example, to another network, the Internet won’t connect. If you have tried a bunch of different fixes already and nothing has worked, then you might want to check your proxy server settings. 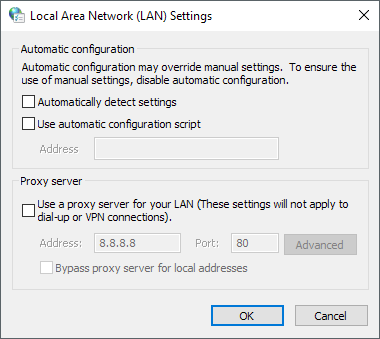 Make sure everything is unchecked in the Local Area Network (LAN) Settings dialog. If that was not the problem for your Internet connection issue, don’t worry, because I have written several other articles that go over other possible causes like anti-virus software, browser issues, etc. Can Connect to Router, but Not Internet? What to Do If Your Windows 10 Start Menu Doesn’t Work?